You all know I like Chai tea, right? Especially vanilla chai. I’ve been known to throw down a few dollars each day to start my morning off with a cup of Vanilla Chai Latte from Starbucks. And while I love treating myself to the drink, the Asian side of me detests the fact that I spend that much money on a beverage. Believe me, I’ve tried to make my own at home. I’ve even bought concentrate Chai tea from Target in hopes of being able to make something similar. I’ve scoured online stores trying to find Chai tea mixes that would come close to satisfying my craving. Many failed to measure up – whether it tasted too much like tea or too much like powdered milk. Finally, I found a solution with Oregon Chai’s Chai Tea Mix. Founded in 1994, Oregon Chai offers seven varieties of Chai tea that are easily prepared by adding milk or adding water – they even have a Vanilla version (yippee!) The Chai is available in concentrate or mix forms, and they have sugar-free, caffeine-free, and vegan concentrates for those with dietary restrictions. Recently they introduced a 10-ounce canister option which allows you to quickly prepare your custom Chai tea. Since the canister contains loose powdered mix and not individual packages. You can add more or less mix so you can increase or decrease the Chai flavor according to your tastes. 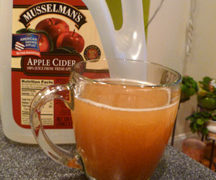 Now that we’re in the tween season of fummer (the month that can’t decide if it’s summer or fall,) on some days you might want a nice cool drink and on other chilly mornings you might want something hot to warm you up. Fortunately Oregon Chai’s Chai tea can easily accomodate both needs. Making your Chai tea is actually pretty simple. For your hot tea, add ~ 2 Tbsp of Chai tea mix to 6-8 ounces of boiling water. I say ~ because some of you might like your tea stronger or lighter flavored. For iced Chai tea, use warm water instead and then pour it over icea. They also say you can add a splash of milk or creamer for extra creaminess. I was feeling adventurous one time and tried to make it with milk only. I think it came out way too creamy, since there is already dried whole and nonfat milk in the mix. When you first mix up the hot Chai tea, it creates a light frothy foam on top. The foam does disappear if you let it sit. Sipping on a hot cup of the Chai warms you from the stomach up. You can clearly taste the traditional chai spices with a sweet honey after taste. I tried to check the ingredients to see what spices Oregon Chai put in their Chai, but they cryptically hid them all under the name “natural flavors,” which I’m sure includes cardamom and cloves. While the Oregon Chai Chai Tea Latte doesn’t taste like one from Starbuck’s (which seems to have more of a spicy kick to it,) it definitely has a delicious and satisfying Chai flavor. With school back in session, it is still very important that we set aside time for ourselves to decompress and re-center ourselves. With everything we have to do, Oregon Chai is encouraging us to take our “Me Time” to help us “maintain focus and balance in our everyday lives.” One way that I take my me time is by curling up in my armchair with a good book and drinking something hot. 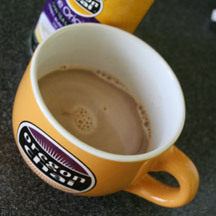 This winter, I plan on adding Oregon Chai’s Vanilla Chai to my list of hot drinks to enjoy. 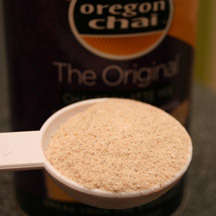 Each of the 1o-ounce Oregon Chai canisters makes about 10 servings of Chai tea. At reasonable price of $5.29/canister, that comes out to about $0.52 -which my money-conscious side likes MUCH more than the $4.00 I pay at the coffee shop. 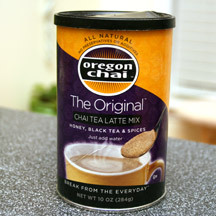 If you are interested in trying Oregon Chai Chai tea products, then check out their website at www.oregonchai.com. Their online store allows you to purchase their Chai in individal containers or in bulk, which will lower your cost per mug significantly. 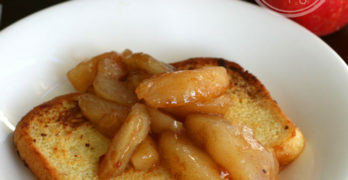 The website also features many recipes -both for drinks and foods – using Chai. To stay in theloop for product news and updates, you can sign-up for the Oregon Chai newsletter, Like them on Facebook, or follow them on Twitter. The WiC Project Oregon Chai Giveaway! Giveaway ends at 11:59 PM EST, September 17, 2010. Disclaimer: This post consists of my (and/or fellow tester) opinions only. No compensation was given for this review/giveaway. I did receive free samples of Oregon Chai products and tools from the manufacturer or representing PR agency to use and test for the purposes of this review. This did not affect the outcome of this review. after reading the website, i still dont know what chai is????? I’ve been drinking the Original concentrate but I’d love to try the Slightly Sweet variety! The Matcha Green Tea Chai Tea latte looks good. The ingredients sound like a party in your mouth! Thanks. I would like to try the Matcha Green Tea. I think I’d like The Original™ Chai Tea. I’m an email subscriber, and I just voted for you-We’re on the Fence. I like the Sugar Free Original Chai Latte Mix. I love the original flavor. I add half soymilk and half water to get a nice smooth, sweet flavor. I also love to get that foam on the top by using the spray nozzle on my kitchen faucet when I add the water, even tho it doesn’t stay that way, like you commented. My day just isn’t complete w/o my Oregon Chai. I also subscribed to the WIC project. I love the Oregon Chai Tea Mixes. The Vanilla is my favorite. I would love to get the sugar free chai tea concentrate! Vanilla Chai Tea Latte Concentrate the most. I am already a Oregon Chia addict! I love it!! I would try to Vanilla or the Matcha Green Tea for something new. I already get your emails! I would like the Vanilla..Yummy!! I think I would like the Vanilla Chai Tea Latte Concentrate . I think the Vanilla Chai Tea Latte Mix would be my favorite! I would like to try the sugar free version. I love the original Oregon chai. I like the Original Chai, but the vanilla also sounds good. What would I most like to fix? The Sugar-Free Original Chai Tea Latte Mix! I’m subscribed by rss feed. I would like the Slightly Sweet Original Chai Tea Latte Mix the best. I’d like to try the Slightly Sweet Original Chai Tea Latte Concentrate, thanks. i have a carton of slightly sweet in my fridge right now! it’s delicious! I would love to try the slightly sweet original! Thanks for the giveaway…we like “The Original Chai Tea Latte Concentrate” the best ! Also subscribed via RSS feed. I have never tried this, but the vanilla chai latte looks good! I would love to try the “Vanilla Chai Tea Latte Mix”. Thanks. Subscribed via google reader. Thanks. The Original™ Chai Tea Latte Concentrate is what I have in my refrigerator at this very moment. I get 3 boxes at Costco. Yummy! I want to try the Slightly Sweet. I would like to try the vanilla chai! I like the Slightly Sweet Original Chai Tea Latte Mix the best.